The RPtecture office seeks to redefine multi-level office space, incorporating a range of minimalistic linear architectural elements and details to boast a measured yet unique aesthetic. The existing site situated at the rear of a small and narrow heritage listed shopfront, required careful spatial consideration and strategic planning. Every detail was meticulously considered transforming the space into a striking and modern design, one that truly embraces the constraints of a narrow site by concentrating the space over the vertical axis. Preserving the significant heritage character of the shopfront, the office exterior hidden behind exhibits a unique linear pattern of natural bamboo timber, ultimately creating a significant juxtaposition between modern and heritage architecture. Internally no detail was overlooked, with recurring elements of light and transparency found in the textures of the structural materials creating an open atmosphere while ultimately forming convenient functionality for individual and collaborative work. 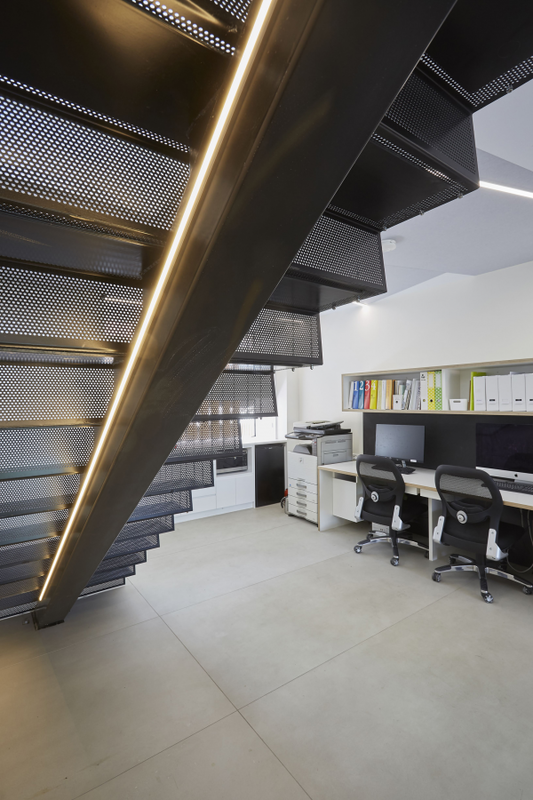 The strategic use of lighting along a variety of structures such as the staircases and desks, work to emphasise and elongate these elements and the space to further enhance the architectural details and ultimately accentuate the purposeful open atmosphere. People working in the office daily will be able to take a break and experience breath of fresh air from their usual grind by using the wide balconies located on the top two floors. RPtecture required a new office space as the old business address wasn't working as well for them. Vincent found the current business site and found potential that could be created from this site. Hence the RPtecture team which consisted of D Fung, A Yu, S Siew and V Choi, with this small team we worked on each detail for drawings and ensured the project ran smoothly. This would not have been possible if we didn't have diligent contractors helping on our project like Michael from Rennew Homes. 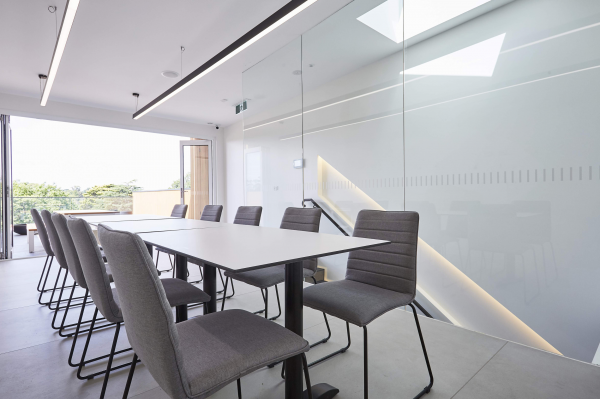 Situated on a limiting block, the project brief was to maximise space to formulate a multi-level collaborative office environment that complemented the surrounding heritage character. Having limited space horizontally, naturally it was decided to stretch the design over the vertical axis. Each level was designed to cater for a different function, with similar design elements echoed and reiterated throughout the entirety of the office building. 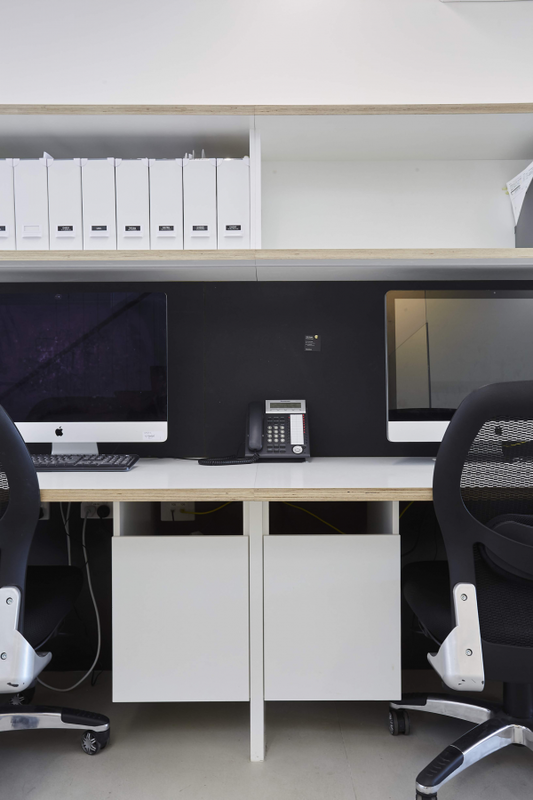 Fusing modern and heritage architecture, the building seeks to re-imagine micro offices, with the minimal fittings and carefully crafted interior design, inspiring collaborative work within the space. 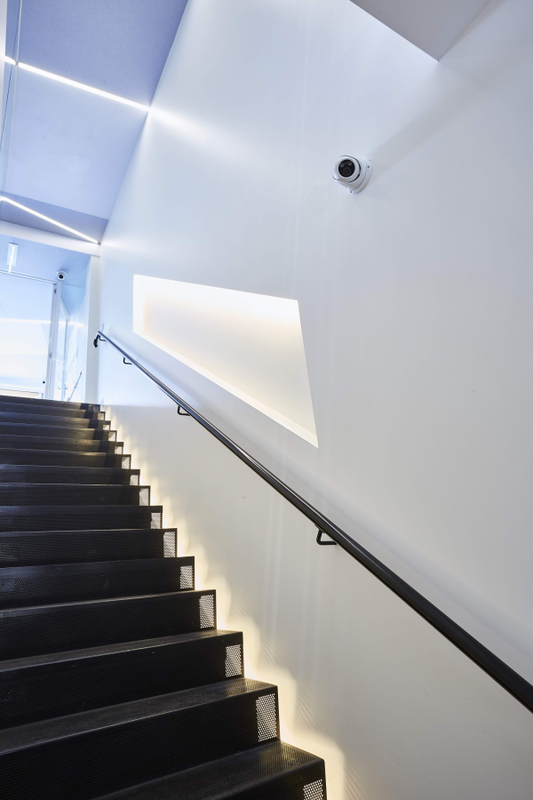 This project sought to move away from traditional office conventions, incorporating non linear lighting fixtures with the subtle zigzag effect of the ceiling lights to create a sense of movement as they appear to run up the length of the office space. Embedded within contrasting ceiling tile colours and geometries, the ceiling ultimately livens up the interior space, bringing some playfulness into the structure. Lighting was also used to elongate the space, strategically placed along the stairways and cabinetry, the light perceptively stretches and emphasises these elements. The raised nature of the structure allows natural light to permeate through the space, as well as helping to frame and showcase the surrounding garden scenery. To showcase a unique interior space, the office used a holistic concept, letting raw materials weave their story throughout the space. Bamboo battens, glass and perforated steel are combined artfully, giving the final finish one of refined simplicity combined with high quality design. With space becoming a precious commodity and the role of conventional offices transforming, this project highlights the need and importance of smart spatial design. On a block of only 4.5 metres wide and with heritage set back overlays, space was the main challenge. Highly considered layout and planning enables open movement throughout the space, enabling collaborative areas and work stations that foster an inclusive and productive office environment. Pushing the boundaries of design, this project demonstrates that aesthetic functional architecture can be achieved and adapted to suit the site despite multiple constraints. The need for modern work places is also highlighted, with the design shying away from a the conventions of a traditional office, exploring ideas of collaboration, openness and transparency in the work place. Our co-working space is the first of it's kind in Canterbury as this facility was not available previously in this suburb. 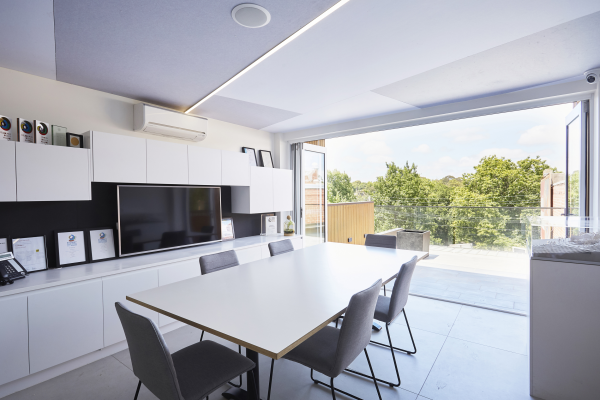 We have incorporated in our design to allow breath of fresh air without leaving the building by including wide balconies that also allow a connection between the indoor and outdoor space with the use of bi-fold doors if bigger space is required. 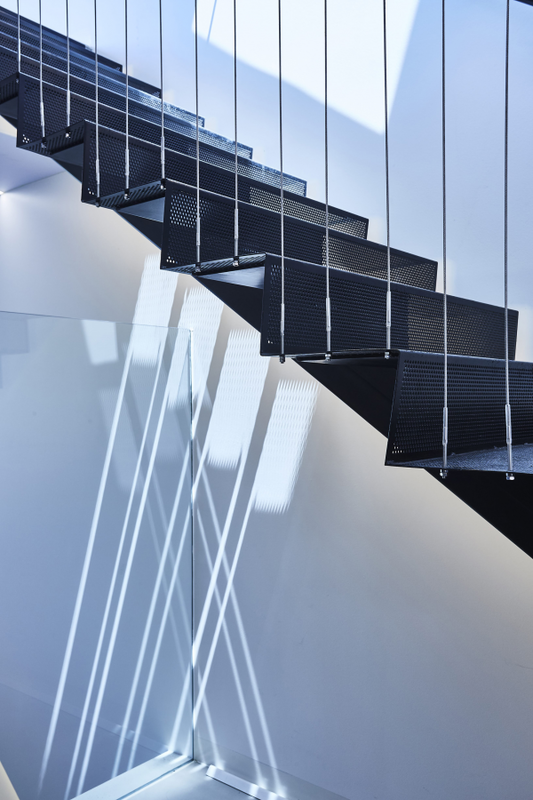 The black perforated stairs blend seamlessly into the elegant space; the thin stainless steel wire rope hand rails fall from the top level to effortlessly hold the staircase in place. The predominant design challenge was maximising space, with particular consideration placed on interior space and interior components. 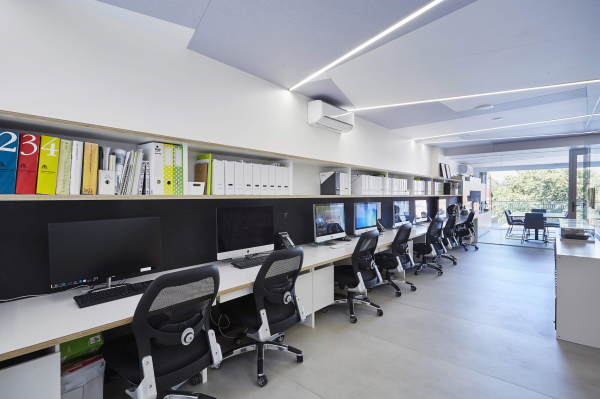 Minimalist clean fittings, combined with open plan design increase the perceived interior space, ensuring the office environment doesn't feel enclosed. Material selection was also increasingly important, with a minimalistic colour palate selected to brighten the space and compliment the featured bamboo wood, glass and perforated steel. Natural light is abundant in the space, with large south facing windows framing views over Canterbury Gardens, further increasing the perception of space. 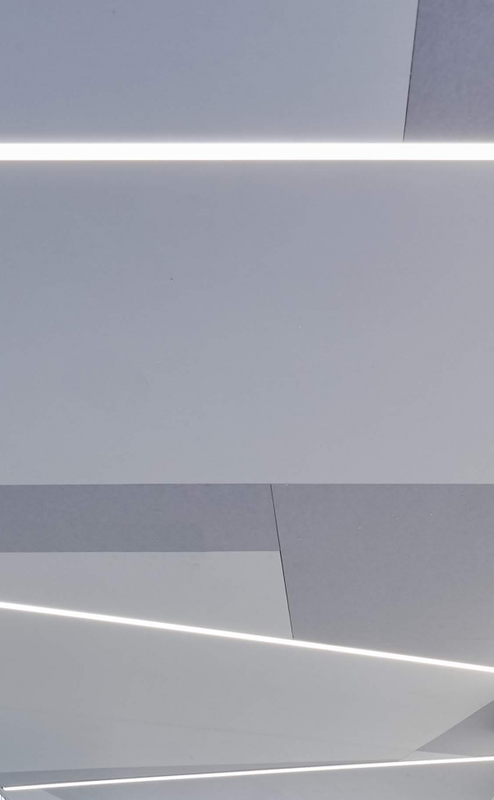 These overall elements give the finish of minimalist linear architectural element s and details which combine to create a unique, functional and playful work space. Being the first to create Canterbury's first co-working, we had no benchmark to compare in close vicinity, however we knew it was market need as many small businesses would want to expand their networks close to home and creating this space allows not only space of their own but to interact with like-mind individuals. 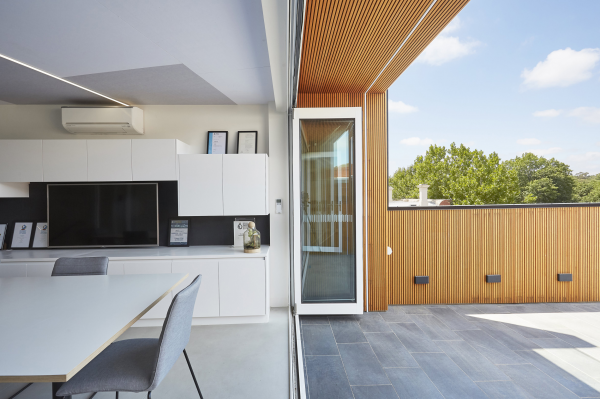 The use of external bamboo battens to encompass the entirety of the building facade is not only a statement design element, but an environmentally sustainable alternative to classic timber or wood. 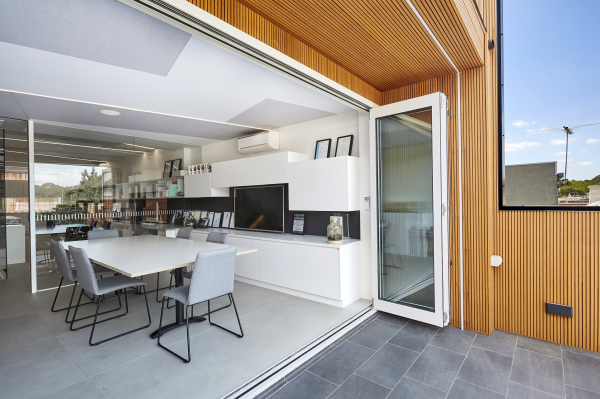 Local materials are also utilised throughout the interior, seen through the aluminium framing of the internal and external glass panels, the interior cabinetry and the glass window panes. The durability standard issued for the various materials throughout the space, ensures they do not require frequent replacements. The use of low VOC paint and glues ensured the interior environment was not hazardous for frequent inhabitants. Furthermore, the utilisation of the stack effect throughout the office is endorsed by the open staircases, allowing for a natural way of heating the higher levels and balconies during winter, while also allowing heat to escape via the open skylight during summer. The double glazing windows allow for effective insulation, capturing the heat of the natural sunlight. Our contribution to social sustainability is endorsed through the introduction of co-working space which is somewhat lacking in the current community.